Bwog Has Regrets, Or Gets Under The Influence… Or Both. Broke their phone in the shower. Hid bottles of lemon and lime juice in someone’s pillowcase. Found bottles of lemon and lime juice in their pillowcase. Made eye contact with an ex-hookup as he grinded on another girl at a party. Bwog Shows Their Social Side By Attending Cool Parties. Knit in the corner at a party, then proceeded to leave within an hour of it starting. Showed up fully clothed to a lingerie party. Got kicked out of a lingerie party for [redacted] reasons. Hosted a “Phantom Thread” watch party. Made watching John Wick 2 on the ceiling possible thanks to a projector from IMATS. Saw Galactic at Brooklyn Steel. Went to two (2) different art museums, including the Frick. Had a three-course meal at a Michelin-rated restaurant for less than 40 dollars. Involuntarily enjoyed Ariana Grande’s new album. Met one of their favorite singers, Dounia. Who makes them? Why are they always red? 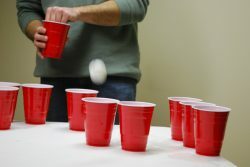 Who decided to make red solo cups?